Hi, I’m Ariel, Michelle’s sister-in-law and editor! Working for Michelle has given me the unique opportunity to not only read and learn from nearly all of the content she’s published on Making Sense of Cents over the past couple of years, but our relationship has given me a firsthand understanding of how her money making and savings tips work in the real world. When I was 20 years old, my now husband and I bought our first house, we’ve added to our family, learned a lot from our mistakes, and we are now building a path towards financial freedom. This year is a big year for our family, as I’m about to graduate from Washington University with a degree in English Literature, and my husband will be adding a graduate degree in History. I’ve never thought of myself as frugal, but the more and more I learn about the concept, I realize that, in a lot of ways, I am frugal. While I have consciously grown this skill set in the past few years, some of my practices have grown out of necessity. In the past, I would rather have referred to my practices as resourceful and aware, but no matter what you call it, frugal means you are finding ways to save money. And, while we all know that saving money is fantastic, finding new ways to do so can often feel daunting. I’ve also kind of never liked the word “frugal” because it conjures up ideas of a family living out in the woods by themselves, canning everything, making furniture from twigs, and sewing their own clothes. Sure, that probably is frugal, but that’s an entirely different lifestyle that I am in no way practicing. If you are, kudos to you, it’s just not for me. Also, I’ve never been a coupon clipper, one to search for deals, or participate in sales. While those are all great ways to save money, again, they just aren’t for me. Still, our family has found ways to be frugal that work for us and often allows us to use the skills we have to save money. 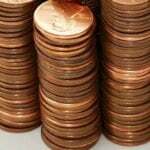 Speaking of utilizing the skills you already have, you don’t have to be a crafter, mechanically minded, or have a particular skill set to be frugal, as a lot of the ways to save money come from just finding easy things to do that save little bits of money here and there. 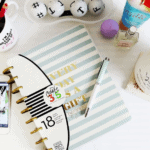 Whether you realize it or not, you are probably already practicing frugality in several ways. To inspire you to find more ways, and to find more ways to be frugal myself, here’s my list of 20+ ways my family and I are being frugal. We’ve never bought a brand new car or taken out a car loan. I’ll be honest with you, there are times that I dream about buying a new, fresh off the lot car. The smell, the warranty, and knowing that it’s highly unlikely anything will go wrong anytime soon is all really appealing. However, everytime I get too far into this daydream, I stop myself and think about how much I love not having a car payment and how I love not paying an exorbitant amount in taxes. We do some of our own car maintenance and repairs. Now, this isn’t for everyone, but it goes along with never buying a new car. When you have a used car, it’s likely that you will need to do some repairs sooner than later. My husband is mechanically inclined, so this works for us. If you aren’t a mechanic, or don’t have one at home, Youtube can be a huge help if you are interested in learning more about simple repairs you can do to your car to save money. We do some of our own home repairs and renovations. Whenever we can, if we have the skills or time to learn them, we do as much of the maintenance and fixing up to our house as possible. Sometimes these are just little things like fixing a toilet or installing new fixtures. Several years ago we did renovations to our house and refinished our hardwood floors (we used a light blue finish that looks amazing! ), replaced our kitchen cabinets and built new butcher block countertops, painted, etc. It did take a lot of time, but we did it all our way on our own terms. This one always gets a lot of questions and odd looks. Cleaning diapers is gross at first, but you find that it gets easier over time. Not only are cloth diapers a great frugal option if you have a baby, they are environmentally responsible. And, if you are planning on having more children, you can reuse the diapers with each subsequent kid for an even greater savings. Fortunately, cloth diapers are becoming more and more commonplace, and there is probably a natural parenting store or diaper swap in your area that can help you explore this possibility. We meal plan and make the majority of our meals. Okay, this one might be obvious, but cooking dinner every night is a frugal task that is easy to overlook. The best way to approach this is by making a meal plan, which includes which nights you have more or less time to dedicate to making dinner. I strategize our meals based on how much time I will have to cook them. Meaning on nights when my husband or I have class, we choose something that won’t take much time, or is something we can start earlier in the day or the night before. And, if you make your own meals, you can make sure you have leftovers for lunch, which saves even more money. Another thing to consider is the cost of meals. You probably already know what types of meals cost more to make and which ones are super cheap. For us, those ones are bean and cheese tacos with lots of toppings, like vegetables, salsa, and limes. Pasta is another good inexpensive meal. If you think about how much each meal is going to cost, you can integrate less expensive meals to save more on your food costs. We try not to waste food. I hate, HATE, finding vegetables or fruit in the fridge that is going bad. I also hate cutting up vegetables for a meal and watching so much of it being thrown away. There are a couple of very easy solutions for this one. If you notice that you have some fruit about to go bad, throw it in the blender with some ice, maybe some yogurt or juice, and turn it into a smoothie. You can even freeze that mix into popsicles. And, who doesn’t like popsicles!? For vegetables, if you’re a gardener, you can compost. But, one of the things I’ve been doing to save those ends and bits of things like onions, carrots, celery, etc. is by throwing them into a freezer bag to make broth out of later on. Once the bag is full, dump it all into a pot, add water to the top of the veggies, add some garlic and/or seasoning, cook down and strain. You can either keep it in the fridge to use soon, or put it back into a freezer bag to use later. I also love using up about to go bad veggies in vegetable stir fry. Make some rice too, voila! We cut meat out of our diet. This is another that isn’t for everyone, but it is saving us a significant amount of money every month. Plus, there is a lot of compelling evidence that suggests that meat is not only unhealthy when consumed too often, but also the production of meat is turning into an environmental and global food crisis. You don’t have to cut out meat completely, but if you cut your consumption down to just one or two meals a week, you’ll be saving more than just your budget. We hire experts when we need to. As you might be able to tell from some of these things, we can be pretty handy around the house, but that doesn’t mean we do everything. There are times when hiring an expert to do something actually saves you money. The cost savings that comes from hiring experts can come in several ways, like saving time, money, or even providing you with a sort of insurance policy. This can be for everything like home repairs, legal needs, financial expertise, etc. We buy second hand clothes. You can find me at the local Goodwill about once a week. I regularly find high quality, on trend clothing for way less than I would buy new. Just this year, I have bought jeans made by the following brands: J. Crew, Gap, Seven, Lucky Brand, and Hudson. I don’t think any of these were more than $8 a pair. I go even farther and if the jeans are too long, I’ve found a great tutorial for hemming your jeans while keeping the original hem. They don’t even look like you’ve hemmed them! I actually find browsing the racks to be pretty relaxing, and if you go early in the morning, it’s not too busy. We do a lot outdoors. As I’m writing this, the average daytime temperature in St. Louis is in the 30’s. Yes, that’s cold, but if you bundle up, going for a hike is nice way to get some exercise, for free, and allow you to explore the area. Beyond hiking, there are parks to visit and free outdoor concerts and movies during the warmer months. We live in a small house. We bought our house based on what we could afford, which wasn’t much. We’re getting ready to look at buying another home, and that one will probably be small too. The five of us, and our two dogs and two cats, all live comfortably in a 900 sq. ft. home. That might not sound like a lot of space, and sometimes it doesn’t feel like it, but with good organization, not adding to the clutter, and decluttering as needed, our small house is a nice fit for our family. Plus, we realize that it won’t be five forever. When our kids are gone, we will reclaim a lot of space! A small home also means we aren’t paying a ton in utilities. We turn down the heat and AC. I should say, my husband turns down the heat and AC. Over the past couple of years he has been slowly adjusting the thermostat, and we are now seeing savings on our utility bills. Every so often we call around to our insurance and phone companies to see if we are missing out on some savings. It may be a small savings, but that $10-$50 a month quickly adds up over the course of the year. And, writing this post reminded me to email my insurance company to see if there were anyways we could be saving more money. When traveling, we visit friends and family, camp or stay in an Airbnb. Hotels are expensive, like crazy expensive! By cutting out hotels, when we can, we easily cut hundreds of dollars off of our vacation budget. Not sure if a friend will let you stay with them, just call them and tell them you are thinking about visiting the area, you might be surprised by their generous offer to stay. Even if you can’t stay with family and friends for your entire trip, paired with camping and/or Airbnb, you can still save a significant amount of money. Receive $40 off your next Airbnb stay by clicking here. I would love to be one of those people with a prolific garden. As in, harvesting enough food to store it for months to come, but I’m not that person. Still, I have a small garden in big pots on my patio. The pots mean I don’t have to weed, yay! We grow basics that we know we’ll use- herbs, tomatoes, peppers, lettuce, some greens, and cucumbers. It might not be a lot, but we sure spend a lot less on these things when they are in season. We also planted about a dozen fruit trees over the past couple of years, and they are finally producing fruit. I’m not sure this will be a huge savings anytime soon, but there is nothing better than plucking and eating a ripe peach from a tree in your backyard. We don’t pay for cable. I think fewer and fewer people are doing this, and it’s saving us all a lot of money. We pay for several types of TV and movie services, and every so often we reassess what we’re watching and pair down as needed. I also keep a total in mind that I don’t want to go over. Learn more at Life Without Cable – Start Saving More Money Today. I create silly spending rules when grocery shopping. These are things like, I don’t want to spend more than $2.50 on a box of cereal. This way I stick to the sales or generic brands, or find another breakfast option all together. 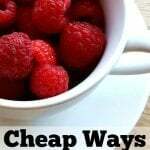 I know food costs vary by area, but these little rules help me stay within my grocery budget. We all probably have a couple of skills that are unique to us, and you can use those skills to barter for things with friends or family. For example, I’m a knitter and I recently needed some graphic design work. I contacted a friend who does that freelance, and we traded her time for mine. She enjoys her work, and I enjoy mine. We each gained something from the transaction that probably kept our overall costs down. You can barter for all sorts of things- watching kids or pets, yardwork, haircuts, car repairs, home improvements, etc. It works much better with friends and family, but you do want to make sure each party is comfortable with the agreement before moving forward. Obviously, it’s very important to keep up your end of the deal. We live in an area that has a lower cost of living. This is another that isn’t an option for everyone, but if you are considering a move, think about how much it will cost you to buy or rent in that area, what types of free entertainment is available, food costs, childcare, etc. Also, it’s important to remember that a city’s cost of living isn’t always a direct relation to quality of living. We live in St. Louis, a town that sometimes get a bad rep, but we have top tier universities, a wealth of culture (think free museums), a thriving food scene, it’s a great place for start-up companies, great schools, and its central location means there is a lot around to drive to. We’ve often thought about moving to the West Coast, but we know that the amount it would cost us to live there means we wouldn’t be able to take as many vacations, save as much, or splurge on things when we want to. We thought a lot about our college degrees. Okay, we have taken out a significant amount in student loans, but we did so knowing that our earning potential with those degrees will allow us to pay them back and then save more in the long run. We also worked to apply and qualify for scholarships, which has saved us tens of thousands of dollars on what we could be paying for our education. Now that we are looking into the future at college for our children, we are actively taking steps that will help them save on college costs. These are things like helping them get good grades, participate in extracurricular activities, and we are prepared to help them find scholarships and talk about options that will cut their tuition costs. We cut our own hair, sometimes. I have been cutting my husband’s hair for years. I trim my own hair from time to time, and we’ve only paid for kids’ hair cuts less than five time. Simple trims and cuts are easy, and Youtube is another place to look for help on this. The last time I had mine professionally cut, it was about $75, which I can’t stomach doing every few months. I don’t mind us paying for haircuts from time to time, but if I can do a trim to stretch out that time in between professional cuts, I am all about that savings. 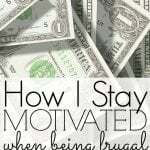 How are you and your family frugal? 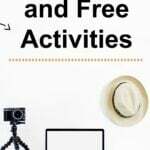 What ways do you suggest adding to my list of frugal practices? I love this, Ariel! I love St. Louis and dream of moving back one day. People think I’m crazy when I say that, especially since we live in Colorado now, but St. Louis is home! I miss the City Museum and the culture in the area. Delmar Loop is another favorite of mine, too. I also cut out meat and dairy for the sake of animals and the environment. I’ve never felt better. St. Louis is definitely great! People always ask why we stay in St. Louis, and it’s because of all of those things you mentioned. I seriously believe that if we lived somewhere with a higher cost of living that we wouldn’t be able to travel as much as we do. Lived in Columbia for 22 years and now live in Gainesville, FL. Although I will always love the Show Me State, I certainly don’t miss the weather! I’m from the Midwest and have visited St. Louis a few times. I agree, it has a bit of a bad reputation but there are a lot of good things about it. The same can be said for a lot of cities – I went to school in Milwaukee and, yep, same thing there. Sometimes you have to just experience it for yourself! Frugal seems like a dirty word to some people but I prefer to think of it as being financially responsible. My husband is far more into it than me. Before I met him he was living in a house that was paid off, a good savings and retirement plan and did a lot of DIY things in his house and had a small garden. After we married we moved into a house he bought with 50% down, mortgage under $900 month with about ten acres of land. The previous house he kept as a vacation rental that we get income from. It needed a few small upgrades, he did about half of them, but adding a propane on demand water heater and wall mounted heater we left to the pros. We had a few fruit trees, he planted 24 more, built raised beds, raspberry, strawberries were added to the blueberries already there. We don’t do cable tv, we have an antenna and cable internet only. We are focusing on expanding our garden to about 1/2 acre. Plenty of room for vegetables and fruits to eat fresh and can/freeze. Raising chickens for eggs and we get venison from The property during the hunting season. Thinking getting another couple dozen chickens to be able to sell eggs and expanding into bee keeping to sell honey as well as another side business. Not big into eating out, and we drive used vehicles, only one vehicle loan. We live rural so we don’t have insane city costs and taxes. We are in a position where we are not worried about living paycheck to paycheck. It is piece of mind. I tried doing the children’s haircuts at home, but I am not good with the scissors or clippers. Fortunately hubby who is handy with tools can handle these as well. He gives my boys their monthly haircuts and I take seat every other month for him to trim my tresses. He does the full sectioning, and trims each layer to ensurecit is cut even, no ponytail hacking. I get compliments on my free haircuts and hubby has given haircuts to a couple of my friends even. We have a lot of spin up expenses with our side businesses, but we try to keep them in reason and know they will pay off and we, I should say hubby is big on keeping the thermostat low at 62 in the winter. He tells me wear a sweater or fleece if I am cold. It is better to keep it cool at night for sleeping and being we both work, why heat up the house when we aren’t even there during the day? Definitely not into wasting our financial resources. 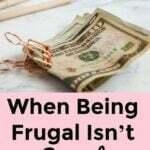 It sounds like you are definitely living a frugal lifestyle! We raised chickens for a little while, and we now just have one hen left. She doesn’t produce eggs anymore, but I guess she’s just part of our family now. I loved being able to go out and collect eggs. We’re thinking about bees in the future too. I also try to create my own entertainment as much as possible. The local library saves me a TON of money, and if they don’t have a book that’s elsewhere in the library system I can order it. Cutting cable out to help cut down on distractions is a great idea, and the benefits are then twofold. We get a lot from the library, and one of my favorite free forms of entertainment now are podcasts. There is so much out there! This is a great list! We went vegan at home to get healthier/protect the environment and have seen major frugal benefits too! We cut our grocery bill by 1/3. We’ll break it at other peoples houses or restaurants occasionally, so we have found the balance that works for us! One other way that we are frugal is we give/get practical gifts. Often these are (well-made) homemade gifts, but this year we are also using some credit card points to treat my parents to a small getaway for their 35th anniversary. Nobody likes gifts they won’t use, so thinking slightly more practically on the gift side boosts our frugality and keeps clutter out of our home. Awesome tips! My fiancee and I do almost everyone of these. There is no sense in wasting money when you don’t have to. Another money saving tip is to use an app like Ibotta to get money back on groceries and other things you have to buy. I think if I could go back in time, I’d opt for cloth diapers. I wasn’t so frugal in my twenties since we both had good jobs and we didn’t start with debt. Now though, we don’t have cable, have a phone plan that costs us 5$ or less a month, and we spend wisely. If we don’t have the money saved, we don’t buy it! Great information and great job on the editing! I wish we knew more about car maintenance. However, I have heard of an automotive company, Christian Brothers, that people say is outstanding with pricing and transparency. They have great reviews in my neighborhood but I haven’t had a reason yet to check them out. I am always looking for ways to improve my personal financial situation, and these tips were quite fascinating. Last summer I cleaned out one of my file cabinets, and have been slowly purging unwanted/unneeded items from my home. I also think twice before making an impulse purchase. When there is less stuff in my environment I can think more clearly and find what I need much more easily. Less clutter = more money being saved over the long haul! I love the idea of doing house renovation myself, I’m trying to learn that. We also don’t pay for cable, have a small kitchen garden for vegetables and herbs. I buy clothes in offseason when it’s half the price. I’m Big on saving electricity and water. I do manicure and pedicure at home as well as simple hair trimming at home. Takeaways are v minimal per year and when traveling we stay at a place with kitchen access so that we save on food bill. This was a great read! Lucky to have such a good influence on your life as Michelle, as well! I definitely do a lot of things and the coupon thing is interesting! I use the Flipp app to do price matching when grocery shopping, it’s very convenient! When I started reliving frugally, cable was the first thing to go, absolutely insane what these companies charge! Great article! I love that so many of your 20 ideas are positive on the environment as well! I’d love to have some property where I can grow my own garden and compost! For now I’ve also enjoyed the cost and health savings in becoming a vegetarian. Bartering is definitely a lost art! Good for you! Love this- it sounds so much like our family! We buy second hand clothes and toys, barter a LOT (in Bali this is standard anyway so good practise!) and don’t buy anything on finance apart from flights on a credit card, and pay them off in full each month. You reminded me to meal plan more, that’s where we fall down!